Du willst mehr über das Thema Nerven der Nasenhöhle lernen? The roof of the nasal cavity, as well as the superior portions of the lateral walls of the nasal cavity and the nasal septum are lined with olfactory epithelium. 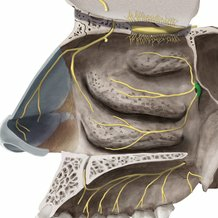 The olfactory apparatus or nasal cavity and associated structures receives two types of sensory nerve supply. It receives special visceral afferents from the olfactory nerve (CN I) for olfaction and general somatic afferents for general sensation via the ophthalmic and maxillary nerves, which are the first and second divisions of the trigeminal nerve (CN V). 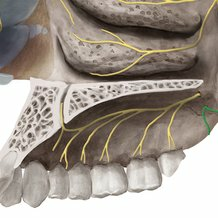 The nasopalatine nerve and the posterior inferior and posterior superior nasal branch of the greater palatine nerve arise from the pterygopalatine ganglion in the pterygopalatine fossa, supplying the nasal septum and the lateral wall of the nasal cavity. 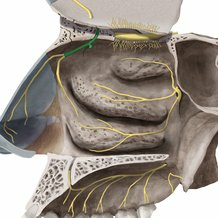 Also arising from the pterygopalatine ganglion are the greater and lesser palatine nerves, which are transmitted through the greater and lesser palatine foramina respectively. 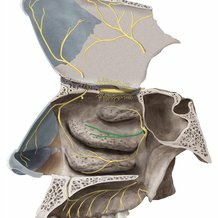 The anterior ethmoid nerve, is a branch of the ophthalmic nerve, supplies the middle and inferior nasal conchae. It gives off external nasal branch, a lateral internal nasal branch and a medial internal branch. 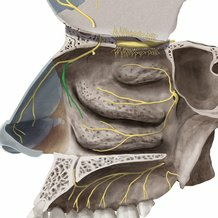 Finally, the olfactory nerve, which is the first cranial nerve, consists of both afferent and efferent sensory fibers. This nerve is pivotal to the olfactory mechanism of the nasal cavity.